Scientists at MIT have designed an ingenious new concept for a battery that operates on the same fundamental principal as an hourglass—it relies on gravity to generate energy. They described the device in a recent paper for Energy and Environmental Science. The fundamental concept of a battery is quite simple. There is a positive and negative terminal; electrons are produced by chemical reactions inside the battery, and collect on the negative terminal because they are negatively charged. Connect a wire between the two terminals, and the electrons will flow to the positive terminal. This wouldn’t be helpful all by itself, but the wire usually also connects a “load”—a light bulb, a motor, a radio circuit—and the energy is harnessed to power that device. 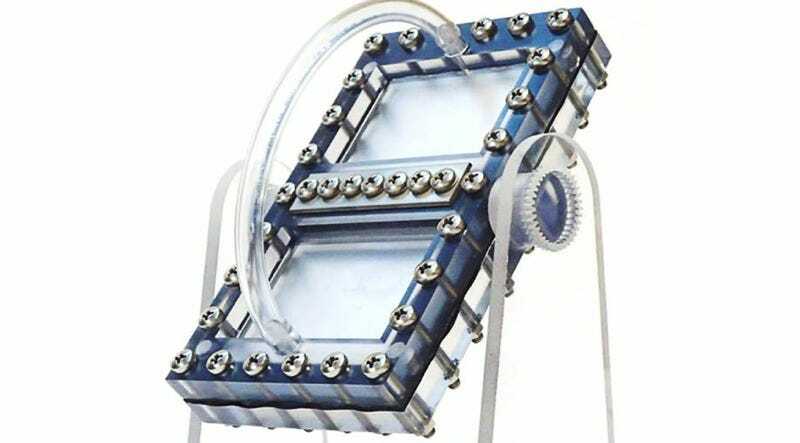 Liquid flow batteries were first developed back in the 1970s, so called because the materials used for the positive and negative electrodes are in liquid form, separated by a membrane. Any number of chemical compounds can be used, except instead of solid slabs, the battery uses tiny particles in a liquid slurry. But even liquid flow batteries typically require complicated systems involving storage tanks, pumps, and valves. That’s costly to maintain, since there are far more possibilities for leaks or failures. So Yet-Ming Chang and his MIT colleagues came up with an alternative design concept for liquid flow batteries—one that simply relies upon gravity as a pump mechanism, substantially reducing the complexity of the entire system, and hence the overall cost. The device looks more like a windowpane than a traditional hourglass, but the concept is the same: the slurry containing the particles flows from one end to the other via a narrow channel. You can change the rate at which energy is produced simply by shifting the angle of the device, much like tipping an hourglass or egg timer can slow or speed up the flow of grains of sand from one end to the other. It’s just a proof-of-concept design at the moment, but Chang et al. are confident they can build a viable prototype. And when they do, it could prove to be game-changer for, say, scaling up wind and solar power systems, by providing larger grid-connected storage systems. There’s been a lot of fascinating work in recent years to come up with ingenious ideas for new kinds of batteries. For instance, back in 2006, a team of MIT researchers led by Angela Belcher created new battery technology based on a genetically engineered M13 virus—small and flexible enough to power tiny sensors capable of detecting cancer or similar disease when implanted into the human body. Sony designed a prototype biotech battery (technically a fuel cell) that uses glucose (sugar from sweet drinks like the Japanese beverage Pocari Sweat) to power the four-cell array. Blood is another good source of glucose, and yes, Japanese researchers have come up with a fuel cell that runs on the stuff, as have teams of Rensselaer Polytechnic Institute and the University of British Columbia in Vancouver, Canada (the latter is designed to power pacemakers, for instance). That’s a stark reminder that all energy has an intrinsic cost.